-Practices the day before afternoon games can often serve as hints towards the following day’s starting goalie, but it’s not completely clear whether the #LAKingsGoalieTweetOff applies. Jonathan Quick was the first goalie off, but neither goalie really lingered on the ice or faced a glut of extra work. A few minutes before Quick left the ice, he spoke with Stevens at center ice. -Jonny Brodzinski, who was assigned to Ontario at the outset of the bye week, has been recalled. He has six goals and 14 points in 11 games with the Reign, which included two goals and five points in three games over the past week. -Jake Muzzin (IR/upper-body) is very close, but it’s not yet clear whether he’ll play Monday afternoon. Muzzin said that he suffered his injury in the 4-3 win over Vancouver on December 30 and tried to play through it, which he did for a pair of divisional games. He registered assists against Edmonton and Calgary, logging 20:08 and 24:06 in the two games before being placed on IR prior to facing Nashville two Saturdays ago. By sitting out the last two games, his consecutive games played streak ended at 281 games. Muzzin said that he’s feeling better than he did yesterday and that the discomfort has been manageable. It now comes down to time, and it’s doesn’t do the team any favors that Monday’s game is a 1:00 p.m. start. -Andrew Cogliano’s first period interference minor on Adrian Kempe has resulted in a two-game suspension. It ends his iron man streak at 830 games, the fourth longest consecutive games played streak in NHL history. Kempe, who left the ice and was checked out by a concussion spotter, returned and finished with just over 11 minutes of ice time. That left the Kings short on centers during a first period stretch of game time that included a power play, but Stevens didn’t have any issues with the match-ups down the middle. Doug Wilson confirms he is working with Paul Martin and his agent “to explore options.” Martin won’t go on the road trip, and could play more games with the Barracuda. Waivers also a possibility. Martin, who has spent time in the AHL on conditioning assignments, has appeared in three games with NHL-San Jose this season but hasn’t played with the big club since December 7. The Sharks, who were 1-2-2 heading into their bye week, resumed play with a 6-5 overtime win over Arizona on Saturday in which Joonas Donskoi tied the game with 15 seconds remaining and Marc-Edouard Vlasic won it in overtime by crashing the net and pushing a loose Joe Pavelski rebound past Scott Wedgewood. –Via Helene Elliott, Pierre Turgeon was not with the club last night as he traveled to Chicago to watch his son Dominic’s NHL debut with the Detroit Red Wings. The 21-year-old Turgeon, a third round pick by Detroit in 2014, had nine goals and 23 points in 40 games with AHL-Grand Rapids this season. 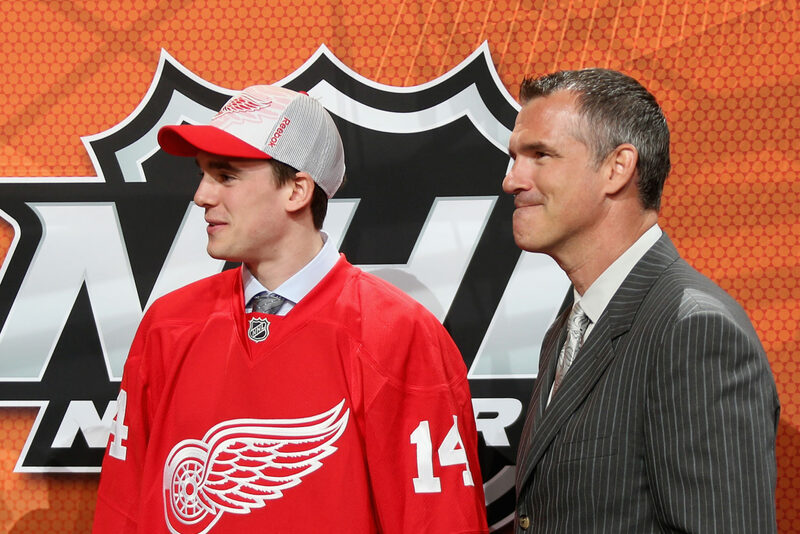 Congrats to Dominic Turgeon, son of Kings assistant coach Pierre Turgeon, for making his NHL debut on Sunday with Detroit. Played 9:01, had one shot, credited with three blocks, per NHL box score.